Epicenter directly simulates Vensim models, using a special Vensim engine. To use your Vensim model with Epicenter, it must be saved as a VMF binary file (file name ending in ".vmf"). Many Vensim models, in addition to the .vmf file, may also use external resources, such as spreadsheets or text files. When working with Epicenter, you can use external data in your Vensim models if that external data is saved in any of the following file formats: *.xls, *.xlsx, *.vdf, *.txt, *.tab, *.cin, or *.csv. There are several steps to complete in order for this to work when you use your Vensim model in an Epicenter project. If you run into any problems, you can check the troubleshooting guide. Step 1. Save your external data in a supported format. Step 2. Load your external data into your Vensim model using Vensim's GET DIRECT DATA method. Step 3. Save your Vensim model as a .vmf file. Step 4. Upload both your Vensim model (.vmf file) and your external data (for example, your .xls file) to the Model folder of your Epicenter project. If you are using the current, Epicenter v2 APIs, that's all there is to it! Step 5 (older Epicenter APIs only). Create and upload a context file (.ctx or .cfg file) to the Model folder of your Epicenter project. Step 6 (older Epicenter APIs only). When you create a run in your project, pass in the files information for the external data in addition to the model information. We'll walk through each step in the example below. Step 1: Save your external data in a supported format. When working with Epicenter, you can use external data in your Vensim models if that external data is saved in any of the following file formats: *.xls, *.xlsx, *.vdf, *.txt, *.tab, *.cin, or *.csv. 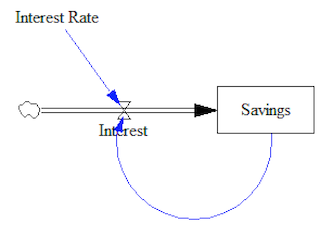 Our example model shows how a changing Interest Rate can affect your Savings. The external data is a *.xlsx file, here called data.xlsx, containing different Interest Rates for each step. You can download the example spreadsheet here. Step 2: Load your external data into your Vensim model using Vensim's GET DIRECT DATA method. Note that other similar Vensim methods (such as GET XLS DATA) DO NOT work with Epicenter. Step 3: Save your Vensim model as a .vmf file. You can download the example model file here. Step 4: Upload both your Vensim model (.vmf) and your external data to the Model folder of your Epicenter project. For details, see more on uploading Vensim model files or the details on uploading project components. If you are using the current, Epicenter v2 APIs, that's all there is to it! The Interface Builder uses the v2 APIs, so if you are working with that, you're all set. Step 5 (older Epicenter APIs only): Create and upload a context file (.ctx or .cfg file), including a files object, to the Model folder of your Epicenter project. The context file must have the same name as your .vmf file, for example, "My Model.cfg" and "My Model.vmf". The context file must contain a files object (for .cfg files) or a mapped_files object (for .ctx files). In both cases, this object includes a key : value pair describing each external data file that is part of your project. The key can be any identifier ("data" in this example), and can even be used as an identifier in your model. The value is the file name of your external data file ("data.xlsx" in this example). After you have created the context file, upload it to the Model folder of your Epicenter project. See more on creating a Model Context file and uploading project components. Step 6 (older Epicenter APIs only): Pass in a files object when you create a run for your project. The contents of this files object correspond to what you entered in the your model context file (Step 5). See more on working with Flow.js and customizing the Flow.initialize() method. See more information on creating runs with the Run API. When you use the current, Epicenter v2 APIs, using external data in your model is really as simple as making sure that you load your external data into your Vensim model and then uploading both the data file and the Vensim model to your project's Model folder (Steps 1-4, above). The name of the model context file (.cfg or .ctx) where you list the external file information must match the name of the Vensim model file (.vmf). For example, if your model is "My Model.vmf", then you must have a "My Model.cfg" or a "My Model.ctx" file in your Model folder. The names of the identifiers that you use, both in the model context file and in the run creation request, may not contain the underscore (_) character. The names of the external files are case sensitive when listed in the model context file. For example, if the file is "data2.xlsx", then listing "Data2.xlsx" in the model context file means that the file will not be found and you will not be able to advance the run. The files object must be passed to Epicenter when you create a run for your project — even though you have already included a files object (or mapped_files object) in your model context file. To create a run, see the example calls in Step 6, above.